The Guidelines bring information from the Covenants, the Resolutions, and the previous Architectural and Property Use Guidelines (2005) together in a single document, organized for easy reference by homeowners who are considering changes to their property. Forms required for a project review, a variance request, and for submitting project comments are also part of the Guidelines, as well as appendices with useful information about prohibited and permitted plants. Just the instructions, forms, and checklist needed to apply for a Project Review. A Project Review must be completed and written approval received prior to making any changes or repairs visible from neighboring properties or common areas. Examples include roof recoating, exterior paint color, windows, doors, home additions, landscaping, solar installations, etc. Before applying for a Variance, contact a Project Review Committee member to discuss your reason(s) for considering a Variance and the type of supporting documentation that may be required. The Board uses this form to solicit comments from homeowners who might be affected by a project involving Subjective Design Elements. The Board determines which neighbors are to receive this form, and it is sent with a self-addressed, stamped envelope, to be returned to the Board Secretary. A list of plants which are not permitted in CFE#7. Existing landscape plants which are on this list may remain in place; however, should any such plant material die, the homeowner shall not replace it with any plant other than those on the approved list "Plant Species Native to CFE#7". Preservation of our native landscape and terrain is one of the primary goals of the Association. In general, it is desirable to enhance the presence of native plants and remove invasive and non-native species. 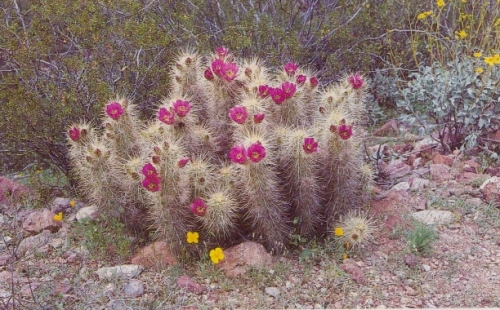 This appendix is a list of vegetation found natively in Catalina Foothills Estates #7, as a reference for our homeowners. Xeriscaping, plant, and water harvesting references. Many residents have inquired about vendors for plants and seeds. While we do not endorse any particular vendor, the listed businesses have indicated availability of seeds for plants found in the Catalina Foothills Community. Mailbox and lamp specifications (Original/Standard) AND Approved Alternate style lockable mailbox.